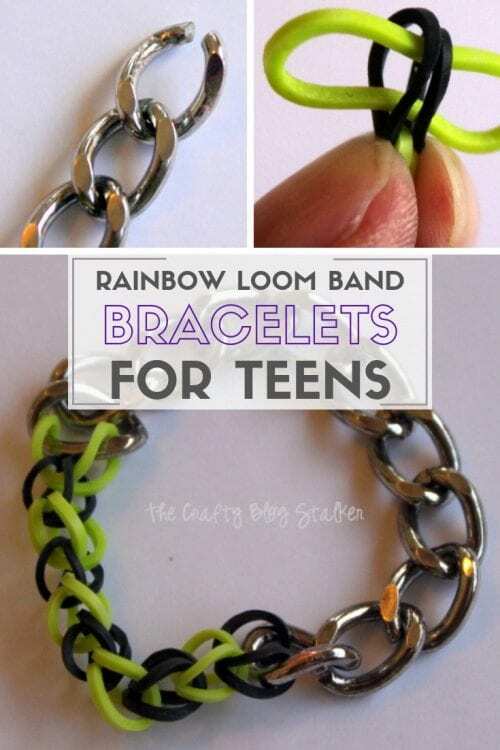 Learn how to make rubber band bracelets with metal jewelry chain, elastic hair ties, and rainbow loom bands. Beautiful custom jewelry with step by step tutorial. Stretch bracelets are very popular and my girls and I have been making a lot of them. 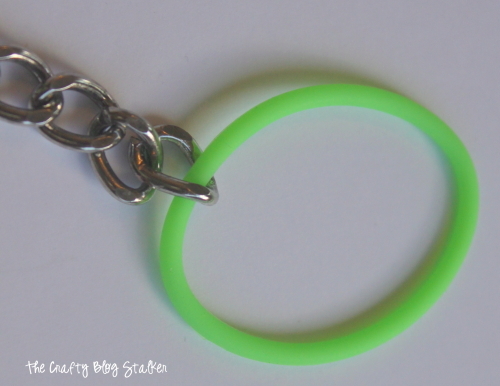 Recently, I made a tutorial on how to make an Easy Stretch Bracelet. While these bracelets are cute, I wanted to step them up a bit. That is how I created these Rainbow Loom Bands Bracelet for Teens and Adults. It all started when I saw this chain at my local craft store. I wanted to make something with it but I wasn’t quite sure what. I went ahead and bought it even though I had no clue what I was going to do with it. My first thought was to turn it into a bracelet using a hair band. I had seen this idea on Pinterest before and I really liked the look of the two different materials being used together. 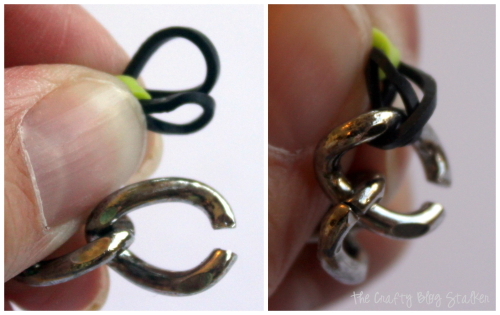 So removed a piece of the chain by using two pairs of jewelry pliers and opening the 11th link on the chain. 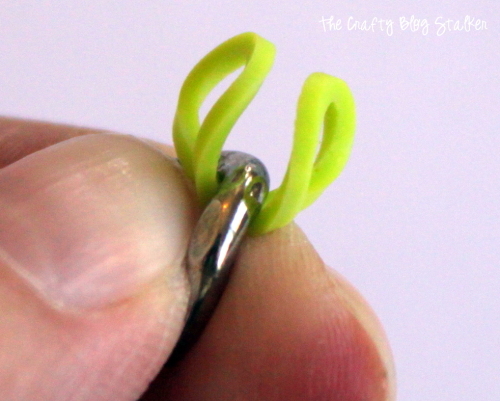 In the opening of the link, I inserted the jelly rubber hair band before I closed it. I then opened the other end of the chain the same way and put the other end of the rubber hair band in the link before closing it up again. For whatever silly reason, I didn’t take a picture of just this bracelet because right away I had an idea for another bracelet. This is when I remembered the Easy Stretch Bracelets I had made a while ago. This time, I took another piece of the chain using the same method as before and removed it from the long strand. 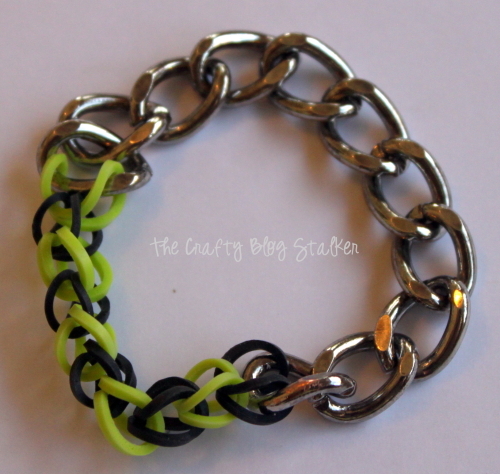 I start the bracelet on the opposite side of the open link, so it is on the last closed link. 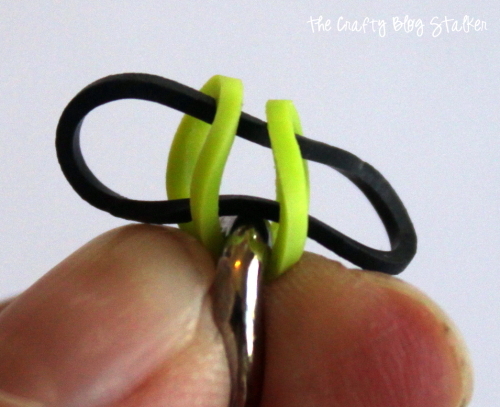 I push mini band half way through the so there is a loop on both sides of the band. Another band through the two loops of the previous mini band. And another mini band through the two loops of the previous mini band. I kept repeating this with alternating colors until I have a strand of mini bands that was a good length for the bracelet. 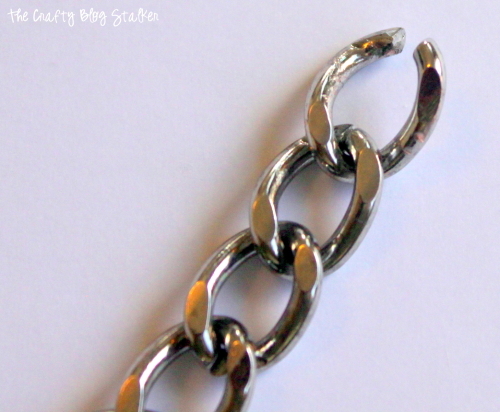 When the strand is long enough I take the open link end of the chain and slide the two loops into the link and close the link using jewelry pliers. I did take a picture of the end result of this bracelet, so I am not a complete failure. I love the look of wearing the bracelets together. 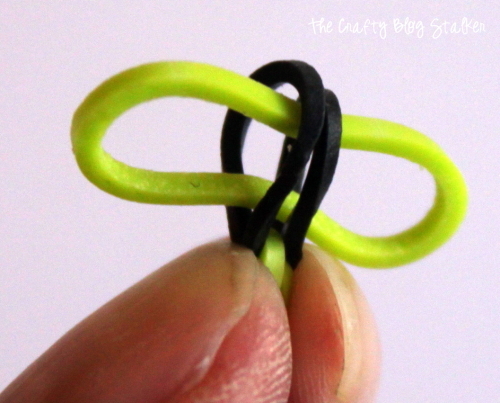 I actually made two with the rubber hair bands and the one with the mini bands. What do you think of the rubber mixed with the metal? Is this something you would wear? Share and leave a comment below! 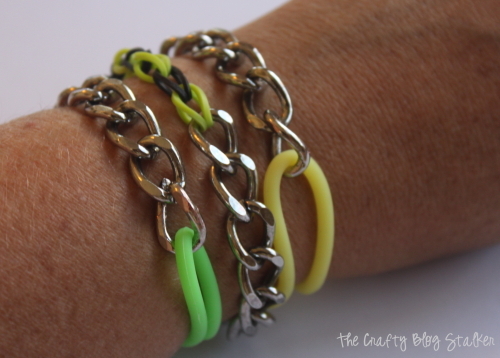 SAVE HOW TO MAKE A BRACELET WITH RAINBOW LOOM BANDS AND METAL CHAIN TO YOUR FAVORITE DIY JEWELRY PINTEREST BOARD! I love this. Im actually wearing one of those rubber band bracelets right now that some kid made me. I would love to redo it with the chain look. I think the chain gives it a more mature dressy look. Thanks for sharing! These are really cute. My daughters are really into the stretchy bracelets and even have a loom. I think they would love to make these. I like the gold chains, it makes them look much more fancy. Hi Katie! These are great and wonderful tutorial! I think these would make great little gifts, too. Thank you so much for sharing at Best of the Weekend and pinning! Hope you have a happy Tuesday and a wonderful week! I love mixing two different materials together to make something special. This is a really cool bracelet. OK Now this is tooo stinkin cute! Genius! My son has been making these bracelets like crazy lately! Now I can put an adult twist to it!! Have you came over and shared these on DIY Sunday Showcase yet?? I’d like to pin this to our board!!! Love this! Found you on Tutorial Tuesday- my daughter would love one of these, I think I found our next project! These bracelets are so cute. Thanks so much for sharing with Adorned From Above’s Link Party. I loved your bracelets. I made some using the pony tail holders but I twisted them so they were in an “infinity” symbol. Love the way they turned out. Thanks for your tutorial. I love these bracelets! So cute and crafty! Thanks for sharing on the Monday Funday Party!